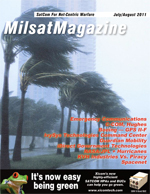 Home >> July 2009 Edition >> PRIORITY BRIEFING: Enabling The Warfighter: Commercial Or Military Bandwidth? PRIORITY BRIEFING: Enabling The Warfighter: Commercial Or Military Bandwidth? By 2014, or a few years after this date, the U.S. Military should have close to 30 Gbps of capacity based on its next-generation satellite program deployments. It is unclear whether this capacity will be adequate or whether the U.S. Military is close to becoming self-sufficient. But as developments around the globe continue put strains on internal capabilities, the need for commercial capacity would appear to continue, if only to achieve some sort of flexibility for military IT planners. Future satcom requirements are likely to further increase such that managing the bandwidth, hardware and software available to militaries around the globe will be a tremendous challenge. In enabling the warfighter, the mix and the management of proprietary and commercial satellite capacity will have to be fairly easy and seamless in order for the warfighter to continue to be effective. In a perfect world, choices can be made on which type of capacity can and will be used for warfighters for specific missions. To a certain extent, this has been tried in past conflicts where so-called critical communications links were run on proprietary military frequencies. Battlefield and theater communications ran on internal military capacity, keeping security and high levels of reliability intact. With bandwidth per soldier requirements as well as bandwidth for machine-to-machine (M2M) type applications exploding, militaries worldwide had to outsource some non-critical requirements on commercial or external capacity. Videoconferencing, communications to and from family members of soldiers to boost morale, and shooting video footage for public relations purposes among others were some of the non-critical traffic that were first managed by the Pentagon to preserve vital internal resources. But increasingly, the line between critical and non-critical applications running on commercial bandwidth has and continues to blur. Applications such as Blue Force Tracking, reconnaissance missions on UAVs and munitions transport that are (in NSRs opinion) mission-critical are increasingly run on commercial bandwidth. In examining the commercial capacity available as well as the internal capacity that is about to be launched by the U.S. Military and other military agencies around the globe, choices on which pipe to use, whether internal or external, is likely to become impractical and thus unimportant. For the warfighter who is equipped with weapons, supplies and other systems that are more directly linked towards warfighting, the choice of the communications link or the RF platform has to be an after-thought or immaterial. Whether receiving critical information from a UAV for situational awareness or identifying allies from foes, the available pipe on standard issue equipment should be able to work seamlessly for a mission in Afghanistan, Iraq, a former Soviet Republic, North Korea or even in the jungles of Latin America in the war on drugs. A multinational force, which is likely to become even more pronounced for future conflicts should likewise easily integrate into a network-centric architecture using a variety of frequencies and communication modes. And here, the key lies in bandwidth availability and footprints. Given that the entire globes military internal capacity will not be launched concurrently and will likely face delays in the deployment schedule, choices in whether to use internal or commercial capacity and more importantly in choosing which applications run on proprietary or non-proprietary assets become highly difficult if not impossible to conduct effectively. If bandwidth is to become unimportant, intelligent terminals, hubs and networks will have to be developed. For the pipe to remain ubiquitous and available, the commercial pipe has to be allowed to remain, for lack of a better word, unintelligent or standard such that any intelligent terminal can point, shoot and communicate securely and reliably on whatever bandwidth is available in the area of operation. Multi-frequency terminals  terminals on military mode are secure, reliable and relatively intelligent. When available, military capacity will likely be the default mode of warfighter terminals when switched on. But should a military satellite be unavailable or over-subscribed, the same level of security and reliability has to be achieved in commercial bandwidth mode. Ground terminals used by the warfighter as well as terminals that support the warfighter such as UAVs for reconnaissance data will have to become multi-frequency that can run on both military and commercial frequencies. And here, the intelligent terminal allows for secure communications using a standard commercial pipe. Software  encryption, acceleration, virtual private network solutions and other software packages have to be developed within terminals once commercial mode is activated to achieve security, reliability, robustness and availability that military bandwidth offers. It is tempting to conclude or forecast that commercial bandwidth use and demand from military agencies around the globe will continue on its historical growth track, which has displayed relatively robust growth. It is NSR view, however, that commercial demand will be negatively impacted in the long term given that almost 30 Gbps of capacity will be added by the U.S. Military. As of end 2008, more than 16 Gbps of commercial capacity was leased for military/government use worldwide, mainly due to a lack of internal capacity by the U.S. Military. With new and growing capacity being deployed in key regions of the globe, as well as terminal development being geared towards military frequencies such as the WGS, some re-pointing of terminals to military-owned capacity is bound to take place. For the moment, it is difficult to foresee commercial bandwidth outsourcing doubling until 2014, given the pullout in Iraq. Although presence in Afghanistan is growing, at best, the same levels of commercial bandwidth use are expected as resources and activities are re-missioned from Iraq to Afghanistan. It is even more difficult to justify continued robust bandwidth growth of commercial capacity outsourcing given the launch of internal capacity from the U.S. Military as well as other governments around the globe. However, that is not to say that commercial bandwidth demand will evaporate in a relatively short period of time. Rather, demand should decline incrementally as military entities begin to rely more heavily on internal resources as well as shift traffic towards their own assets. But the need for redundancy and the recognition that hotspots around the globe can develop virtually overnight where military capacity may be lacking ensures that commercial bandwidth will continue to play an important role in military planning over the long term. In fact, it is NSRs view that with applications being developed, which will become even more bandwidth-hungry, commercial capacity demand should pick-up once again at around the 2015 timeframe. In looking at the future warfighter, developments are taking place to enable the Future Force Warrior (FFW) to reach Gbps of throughput where tactical intelligence/collection, enhanced situational understanding, embedded training, and on-the-move planning are achieved. The broadband requirements of the FFW ensure commercial bandwidth demand to once again increase. The warfighter is deployed in many parts of the globe, based on developing situations or what happens to be the global hotspot at the time. Bandwidth has in the past hampered the warfighter, simply because bandwidth requirements have to be internal capacity for security reasons or commercial capacity is unavailable, expensive or already owned/leased by commercial entities such as news networks. Militaries around the globe have learned from past experience and continue to deploy internal capacity in anticipation of future needs. At the same time, the military has professed its continued reliance on commercial bandwidth as part of its bandwidth planning efforts. The next step in enabling the warfighter lies in building smart ground terminal equipment and ground networks in order for commercial satellite bandwidth to approximate or even be at par with the security and reliability features of internal military resources. The bottom line is  the warfighter shouldnt need to make a choice or configure his/her terminal between commercial or military bandwidth in order to be enabled and effective. The warfighter should be able to simply point-and-shoot. The availability of bandwidth  regardless of the frequency  has to be integrated into future warfighting efforts.